I don't know if I would consider anything the FBI does to be important in the choice of a carry cartridge. They started years back with 38s, then 357 mags but wanted more stopping power in a semiauto. In 1983 they adopted the 10mm. But, they found that most of the guys packing them were too much of a wuss to shoot the cartridge and hit anything at 7 yards including their car. The round is more than a 45ACP pushing a 200gr bullet roughly 300'ps faster. They could have gone to a lighter bullet but instead went to a small, shorter version of the 10MM we now call the 40 SW. But the same issue came up with the troops not being able to handle the recoil. Again, they were shooting the 180gr bullets as issued ammo. They could have backed up to as light as a 135gr bullet that is running about 250'ps faster than a 9mm but no. They wanted new guns to play with and needed to screw off more of your tax dollars. Now they are down to the girly 9mm and want to shoot the 147gr bullets because they still want the penetration. Frankly, I find it kinda scary that these guys even have a gun. If you can't stand the recoil of a 40SW, you need to sit over with the girls on the bench and watch. The 9mm has a big following mostly due to low recoil and cheap ammo. But low recoil and cheap ammo is not what I would want to defend myself with. If the hole in the barrel size doesn't start with a 4, I don't want it. There are 2 rules to follow in any confrontation. Rule one- NEVER be the second one to shoot in an exchange of gun fire. Rule two- NEVER defend yourself with any caliber of gun that the caliber starts with anything but a 4....like a 40, 44, 45, etc. Yeah, a 380 beats a sharp stick, but not by much. The scenarios presented by most are those that have had zero experience in any confrontation and most are scenarios straight out of TV. Unfortunately, life doesn't work like that. I think the best, probably most accurate confrontation I ever saw on screen was in Open Range. Lots of shots fired, hardly any hits. That's because the last thing you'll ever do in a confrontation is think. It takes incredible focus for anybody to align sights while bullets are flying in their direction. Self preservation trumps good shooting skills 100% of the time. That's why a big heavy bullets makes the difference. You don't have to make a perfectly placed shot to put the bad guy down. What are your favorite cartridges based on the gunfights you've been in? Have you ever used a .380 for serious social purposes? I enjoy watching Paul Harrell’s video and his use of “meat target” simulating human muscle, rib cages, & lung tissues. He makes some very valid points in this video. Y'all go right ahead and lumber around with your Desert Eagle .50s backed up by your .45ACP & 10mm cannons. I will tote my .380 or 9mm just fine. Nice, ain't it? Great HD gun, IMO. Never going to carry it because it is too big to conceal & too heavy. That's why it is in my night stand. I even quit carrying my Kahr CW45. It's just a tad bit too much for comfort these days. The CW9 that is now in my rotation suits me just fine. 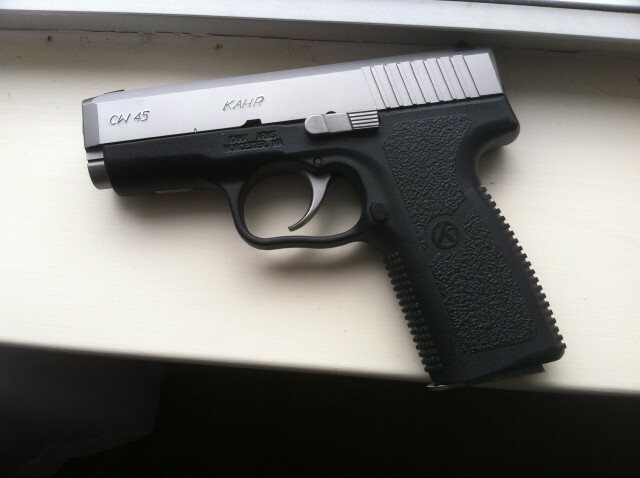 How do you like the trigger on Kahr? I checked them out at my LGS. There’s a lot to like about Kahrs, slim, light, good capacity. I just didn’t like the trigger. I admit I am a trigger-snob, spoiled from my S&W revolvers and 1911s. I like short crisp light triggers. Those rules have successfully been broken too frequently for them to have much meaning. Too many interviews with successful gunfight survivors have provided enough information to dispel those myths as well. I would rather carry a .357 snubby loaded with .38sp than a .380 if I really needed something small and was sensitive to recoil. That's what my daughter carries (and she's also questionable about getting a slide pulled in a crisis). It's hard to find a .380 in a frame heavy enough to tame the snap. The reason 9mm have a reputation for being mildly recoiling is because they usually come in heavier frames. I personally find about 19-20 ounces to be the critical weight point--anything lighter feels snappy to me in any centerfire load. Above 20 ounces, 9mm to .45 is fine. There is a huge, real--but unquantifiable--factor involved with the psychology of the attacker. If the attacker is in warrior mode, he will be very hard to stop. In most of the gunfights that are started by gunmen against or with police, or between gangbangers, terrorists, and such, are with assailants who enter the battle in warrior mode. That's where you get most of the stories about people taking awesome firepower to bring down. OTOH, guys who attack old men and women are usually in predator mode. They don't intend to encounter any resistance--and they're probably punks anyway, which is why they go after weak targets. Very often, despite being armed themselves, a few pops from what they expected to be an easy mark will send them running. That little old lady with the .38 snubby may be better protected against the punk who would attack her than the cop with the 9mm against the serious thug who would attack him. Last edited by Ralph_Kirk; 03-15-2018 at 07:38 AM.. There are full size 380 pistols in the market, my favorite is Sig P-230/ P-232 in stainless, but at that size you might as well carry the 9mm. Use the 115 gr for lower recoils. The other aspects is ammo manufacturers have spent R&D efforts on popular law enforcement ammo, e.g. ; 9mm and 40S&W to increase HP expansion while satisfies FBI criteria for penetration (12-18 inches). So by sticking with these popular calibers, you benefit from these advancements in bullet technology. What about 45ACP? While 9mm tries hard to expand, the 45 do not shrink!